Dr. David Rock on the neuroscience of leadership and the SCARF Model: a brain-based framework for increasing effectiveness in collaborating with and influencing others. I have been following the work of Dr. David Rock for quite some time now. For many years, he has been exploring the field of neuroscience and its implications for management, coaching, and organizational life. He believes that neuroscience research will be a significant factor in reshaping how we define leadership, select leaders and design leadership development programs. I sat down with David to talk about the SCARF model which he developed to describe the five social domains that drive human behavior: Status, Certainty, Autonomy, Relatedness, and Fairness. By understanding these main drivers, we can increase our effectiveness as leaders when collaborating with and influencing others to enhance motivation and engagement. Dr David Rock is the author of ‘Personal Best’, (Simon & Schuster, 2001), ‘Quiet Leadership’ (Harper Collins, 2006) and ‘Coaching with the Brain in Mind’ (Wiley & Sons, 2009), and ‘Your Brain at Work’, released in October 2009. How did you get interested in the topic of the relationship between Neuroscience and Leadership and why should people leading projects pay attention to this topic? Define for our audience the idea behind Neuroleadership and what makes it different from other leadership models that you have researched and experienced? How does the Neuroleadership Institute and Summits, which you have founded in 2006, contribute to the advancement of this field? You say in “SCARF: a brain-based model for collaborating with and influencing others” “…much of our motivation driving social behavior is governed by an overarching organizing principle of minimizing threat and maximizing reward…”. You developed the SCARF model as an easy to remember framework for understanding and becoming aware of 5 core concerns that drive human behavior when we are collaborating with and influencing others on our projects. Give us a brief overview of the SCARF model and its 5 core domains. 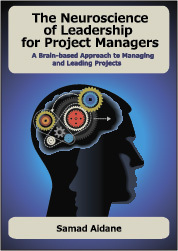 You say in “Managing with the brain in mind” that “the brain experiences the workplace first and foremost as a social system” you go on to say “…if you are a leader, every action you take and every decision you make either supports or undermines the perceived levels of Status, Certainty, Autonomy, relatedness, and Fairness in your enterprise”. I would like us to go over each of the domains of the SCARF model and briefly talk about its implications for collaboration and influence in the context of the “micro social systems” of projects. If our listeners want to know more about Neuroleadership, what resources do you recommend to them? The theme of the 2010 Neuroleadership Summit in Boston was “Rethinking Leadership”. What were some of the key takeaways from this summit and what should we look forward to for the 2011 summit in San Francisco? Tell us about some of the interesting projects you are working on these days. David is one of the thought leaders in the global coaching profession. The integrated coaching system he developed in the mid-90’s has been taught to over 10,000 professionals in more than fifteen countries. In 2006 he co-authored a feature article in strategy business magazine with neuroscientist Dr Jeffrey Schwartz, called ‘The Neuroscience of Leadership’, the most downloaded article of the year at the magazine. In September 2006 CIO magazine ran a cover story featuring David and Jeff’s work called ‘The new science of change’. His paper ‘Managing with the Brain in Mind’ was the most downloaded of 2009 at strategy business.